Sorcery Charges On The Rise In Saudi Arabia The Lebanese host of a popular TV show who gave callers advice and sometimes predicted the future was sentenced to death by a court in Saudi Arabia in November for sorcery. Human rights groups say these cases are on the rise in the strictly religious country and birthplace of Islam. 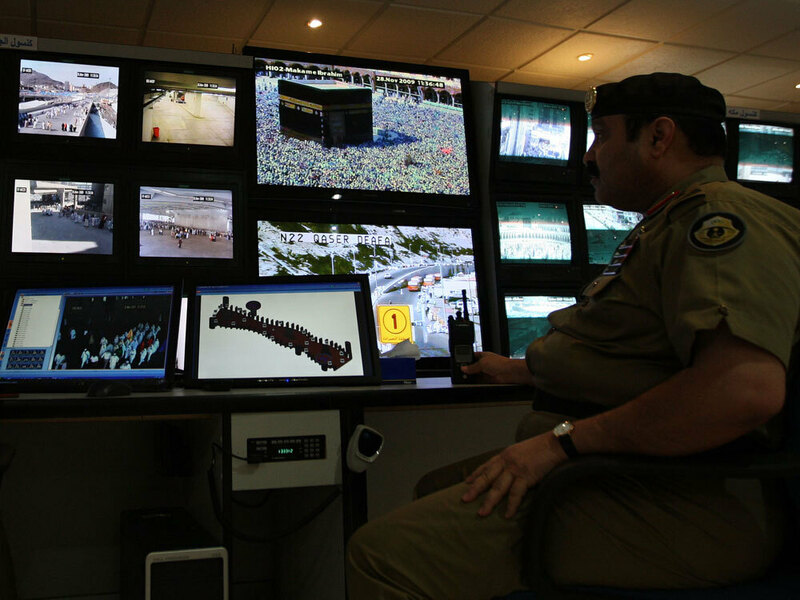 Saudi police officers monitor screens connected to cameras at all of the holy places in Mina near Mecca, Saudi Arabia, in November. Human rights groups say such cases are on the rise in the strictly religious country. Saudi officials have arrested Saudis and non-Saudis, Muslims and non-Muslims on sorcery charges. In recent months, a Saudi man was arrested for smuggling a book about witchcraft into the country. An Asian man was accused of using his powers to solve marital disputes. And a third man was given a death sentence for trying to learn magic. In 2007, Saudi authorities executed an Egyptian pharmacist for sorcery. Sarah Leah Whitson, the Middle East director at New York-based Human Rights Watch, says the problem is that Saudi Arabia has no specific law governing such crimes. Instead, judges view people who believe in the supernatural as heretics and often sentence them according to the judges' own personal training in Sharia, or Islamic law. Whitson says this means anyone could be targeted. "You will never know on any given day whether the book you are reading or the words you are saying are going to be interpreted or used against you deliberately as a form of witchcraft," Whitson says. Belief in genies, or jinn, as they're called in Arabic, is quite common in Saudi Arabia. But the strict form of Islam practiced in Saudi Arabia forbids people from worshiping anyone other than God. The religious police headquarters in Riyadh, the Saudi capital, has an entire department devoted to combating sorcery and witchcraft and regularly distributes pamphlets and DVDs. In one DVD, which is set to religious music, police search people's homes for signs that they practice witchcraft. Saudi political analyst Tawfiq al-Saif says religious authorities truly believe they are helping society by discouraging faith in the supernatural. But, he says, there is also a political reason for the recent rise in sorcery cases. In the past few years, the government has tried to curb the influence of the religious establishment by sacking key religious figures, pushing for reform in the courts and criticizing the religious police. "One time, I met the head of the Hey'a [the religious police] and he was really sorry because in the past he was saying that they were free to do whatever they like to enforce the Sharia laws — even, he said, in the public buses, in the train, in the airports," Saif says. But now that they are under pressure, the religious police are trying to flex their muscles in the few ways they still can, including looking for people who practice magic or who don't pray five times a day, and for women who don't properly cover their hair, Saif says.